​(L-R): Vicky Shepherd - Age UK Blackburn with Darwen, Councillor Mohammed Khan, Tahir Idris - Telemagenta and Lynne Lucas - Twin Valley Homes. Delivered in partnership between the Council and providers Age UK Blackburn with Darwen, Twin Valley Homes and Telemagenta – the scheme is offering free trials of various equipment to give residents more control over their care. 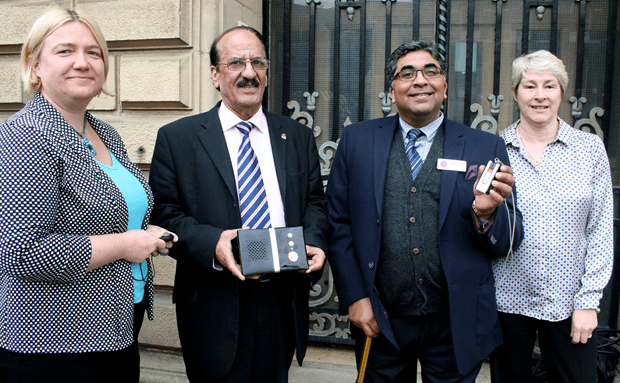 The pilot is being delivered as part of Blackburn with Darwen Council’s Safe and Well Programme which promotes the use of the assistive living technology and devices such as panic buttons, falls detectors and much more. The pilot is aimed at people not currently eligible for social care but who wish to trial the technology based on their needs. The Council has agreed to fund the trial scheme for people identified as being suitable for it. Via Twin Valley Homes, eligible people will be able to try out an alarm unit and pendant which can be pressed at any time to put its user in touch with a dedicated member of staff who will provide either reassurance, information or help in an emergency situation. Similarly Age UK can provide free installation of a personal alarm pendant and wrist band to eligible people over the age of 50. Telemagenta will be able to offer various stand-alone products including memory books, reminder gadgets, simple mobile phones with alert buttons and GPS devices which can locate people in case of emergency. The Care Network and the Council’s Your Support Your Choice (YSYC) centre are also involved in the project and will be actively promoting it to potential customers as well as ensuring people are referred onto the correct provider who can meet their needs. For more information contact: (01254) 292620.